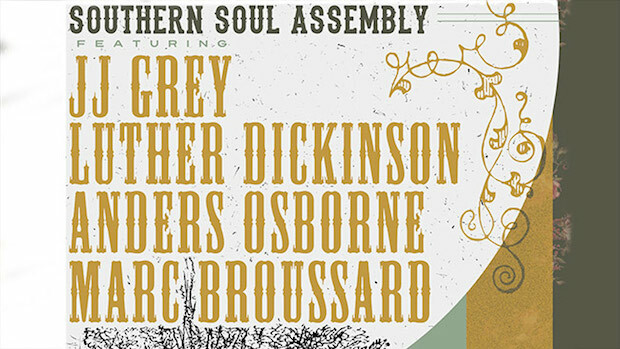 The Southern Soul Assembly Tour makes its Nashville stop tonight at the War Memorial Auditorium. The tour features southern artists JJ Grey, Luther Dickinson (of North Mississippi Allstars), Anders Osborne, and Marc Broussard with support from Kenny Foster. The War Memorial Auditorium has been hosting some amazing concerts this year, and tonight should be no exception. Check out below after the jump for more info on the artists as well as some YouTube videos. Florida native JJ Grey has been described by the New York Times as bringing, “Impassioned singing, riff-based Southern rock, cold-blooded swamp funk and sly Memphis soul,” to the stage. Having released his sixth studio album, This River, in 2013 with Blues record label Alligator Records, we are excited to see him and his band, Mofro, pull tunes from an outstanding catalog of soul music tonight. If you saw our coverage of the recent North Mississippi Allstars show at 3rd & Lindsley or of SXSW, you know that we are picking up what Luther Dickinson is putting out. So we are excited about tonight’s show but also the upcoming release of his new album Rock n’ Roll Blues due to be released at the end of the month. Anders Osborne, another Alligator Records artist, brings a slightly more jam band sound to the tour. This Sweden native settled in New Orleans in 1985, and by then he had already been heavily influenced by American artists like Neil Young, Ray Charles, and Robert Johnson. Marc Broussard first caught our attention in 2005 with the crushingly soulful and epically catchy “Home.” He’s kept us interested with a steady stream of releases since then, including his most recent releases, a live album and full concert video, both named Marc Broussard LIVE from Full Sail University. Kenny Foster, a Joplin, Missouri native, brings the more country side of soul to the lineup. As our name indicates, country music isn’t usually our focus. However, based on what we’ve heard and seen of Foster thus far, we are very excited to continue to get to know him. The Southern Soul Assembly Tour will perform TONIGHT at The War Memorial Auditorium. The show is all ages, begins at 7 p.m. (doors at 6 p.m.), and tickets start at $25.